Charity Balls such as last friday’s Posh Frocks Ball at Hadley Park House Hotel, Telford take a lot of hard work to organise and raise the funds for their chosen charity. You want your guests to have a fun and a memorable time. So if you are like Kim Gilmour organising a fundraising ball, why not do what she did – and have a photographer at your event? Here are 3 reasons, why it could be a good idea for your fundraising ball. Firstly, it creates a buzz and a reason for guests to move around the room and walk past the raffle/ silent auction table if you have one. They have had a great hair do and maybe a new dress and would love a photo. They may be with their partner or their friends and want to remember the night together. Secondly, if you put your business or charity logo on the photo, your guests will have a permanent memory of your event, on the photograph. If you have regular events, you can get your logo on the mounts aswell. And of course, you will raise extra funds from photo sales towards your charity target or offset some of your costs. So next time you are arranging a fundraising ball, give us a call to find out about how you can increase your charity profile, raise more funds and ensure your guests have an enjoyable and memorable time! 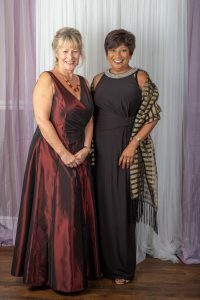 Carol Bailey Photography includes the jpg with every print, so your guests have great images to share on social media to tell people about your fabulous event. I have a confession. I have been using an old business headshot of me across my social media platforms, I mean really quite old…. more than 10 years, because it was the only ‘professional’ picture of me that I liked. And it was not even a studio shot. It was a press shot that I happened to like and I did not have a high resolution version of it either so I have not been able to use it in leaflets or fliers. My reluctance at having some new shots done comes, I suppose, from a slight lack of confidence about my looks now I have reached a certain age (50 plus let’s leave it there). However, I have been thinking for quite a long time that I need to get something done and have looked at various local photographers. Some offer a full ‘make-over’ package but I wasn’t sure that would show the ‘real’ me. I remember being made up in a Mauritian beauty parlour by four or five very excited young ladies for my wedding. By the time I came out I was a definite shade of orange with lots of eye make-up and I hardly recognised myself in my wedding video – but that’s another story. Suffice to say I wasn’t going down that route. A couple of weeks ago I met Carol Bailey at a networking event and we hit it off and swapped business cards. I said I was interested in having some head shots done. I checked out her website www.carolbaileyphotography.co.uk and I could see Carol was very talented and creative despite only being in business full time for a year or so. We made arrangements to meet up at her home studio, which is very accessible off the A5 near Cannock and Wolverhampton, although she can come to your home or office with her portable studio. 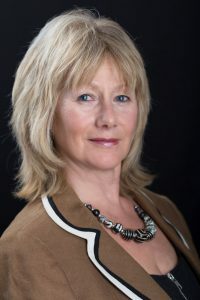 Carol immediately put me at my ease and after a friendly chat and a cup of tea whilst she set the lighting up, Carol began to take lots of test shots for my business headshot with different lighting and camera angles. She let me into the secrets of how to stand, how to tilt my head to get the best possible shots and it got easier as I became more relaxed. I was pleasantly surprised at what a great range of good shots were coming out, utilising a couple of different jackets and backgrounds. One of the great things about having your head shots done with Carol is that for a whole year afterwards you get access to your shots via a log-in to her web-based client gallery. She edits 8 – 12 of the best shots and then also lets you have all the others so if there are some that you like you can have those edited as well. All shots available as both high and low resolution (you need the latter for digital applications like websites and social media). Some photographers charge nothing for a photoshoot then they want a lot of money for high resolution pictures after the shoot. Everything is very upfront and honest with Carol. 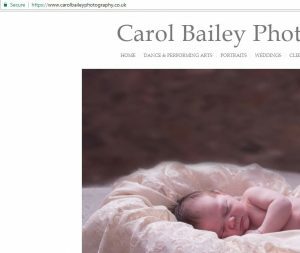 All in all the experience was actually quite enjoyable, no doubt because of Carol’s three P’s – her patience, personality and professionalism and I would definitely recommend Carol to photograph all your business images and family occasions. My images are now getting lots of likes on my webpage and social media platforms – thanks Carol! Costs are £75.00 for the headshot session at the studio or on location or just £125.00 for three staff members and a team shot. To all you lovely couples – have a very happy Valentine’s Day. I recently had a great afternoon photographing the gorgeous Emily (pictured left) and we just added a fun pink heart to create a photo to use this Valentines Day. If you got engaged recently, you will have so many exciting ideas even if you havent set the date yet. Wedding Fayres are a great way to get ideas and start to get a feel for prices and options available to you. Check out my facebook page to find out when I will be at a Fayre near you – the next one is in Telford in March. I do a FREE home consultation where you can see examples of the weddings I have photographed and find out how we can photograph your wedding and capture those precious moments. If you haven’t set the date yet, why not celebrate with an Engagement Photograph ? You may well have heard the words “SSL certificates”, but do you know what that means and why does it matter? Well, this is the post for you. An SSL certificate simply authenticates the identity of a website and encrypts information that is sent over the Internet so that it remains secure. You can tell a website is SSL certified, the website name will start with https:// (whereas an unsecured website will start with http://). My website also shows a small padlock icon to the left of the web url to show that the website is considered secure and a safe place for you to visit. HOW DOES SSL MAKE THINGS SAFER? Because customers sometimes have galleries with their images on my website and some will make purchases directly from those galleries, it is essential that when you share data with Carol Bailey Photography or make online payments methods you know it is secure. SSL is used to secure data that is transmitted over the Internet between a computer and a server. With SSL all information that is transmitted becomes encrypted so that it is completely unreadable to anyone and anything except the intended server. This makes data sharing and online payment methods far more secure. 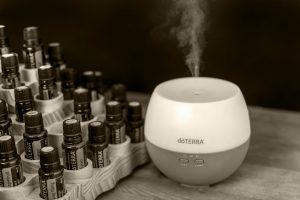 I had the pleasure of photographing Sam and Nick Barratt and their fabulous doTERRA oils last week. The perks of being a photographer is you meet people from all kinds of businesses and find out about the fabulous things they do. 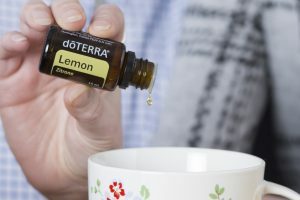 These oils are fantastic – from relaxing Lavender, to peppermint and orange to revitalise.